Another one today and this really ends a long journey for me. This year I had a goal to try a whisky from every distillery in Scotland currently available. I was pretty close but then Ailsa Bay and Wolfburn came out. I bought a bottle of Ailsa but the Wolfburn eluded me for a while. Finally, when ordering my Kilkerran 12 from Master of Malt I spied a sample! So this is it, I've now tried at least one whisky from every distillery currently releasing their whisky. 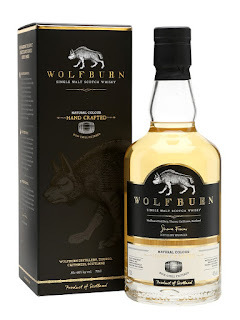 Wolfburn is a new distillery, the northernmost in mainland Scotland. It has just started releasing their whisky, so this is one of the first releases really. This was partially matured in ex-Peated Quarter casks, probably from Laphroaig. Nose: Young, light fruit, light smoke, seaweed, driftwood. Water: NMS, clean and bubblegum like. Taste: Soft arrival, young fruit, pear, some smoke, seaweed, ginger, ginseng tea. Water: Softly smoky, NMS notes, bubblegum, some spice and oak. Finish: Medium length. More smoke and ash kicks up. Alright for 3 years old but glad I didn't pay the money for a full bottle.